Good morning! 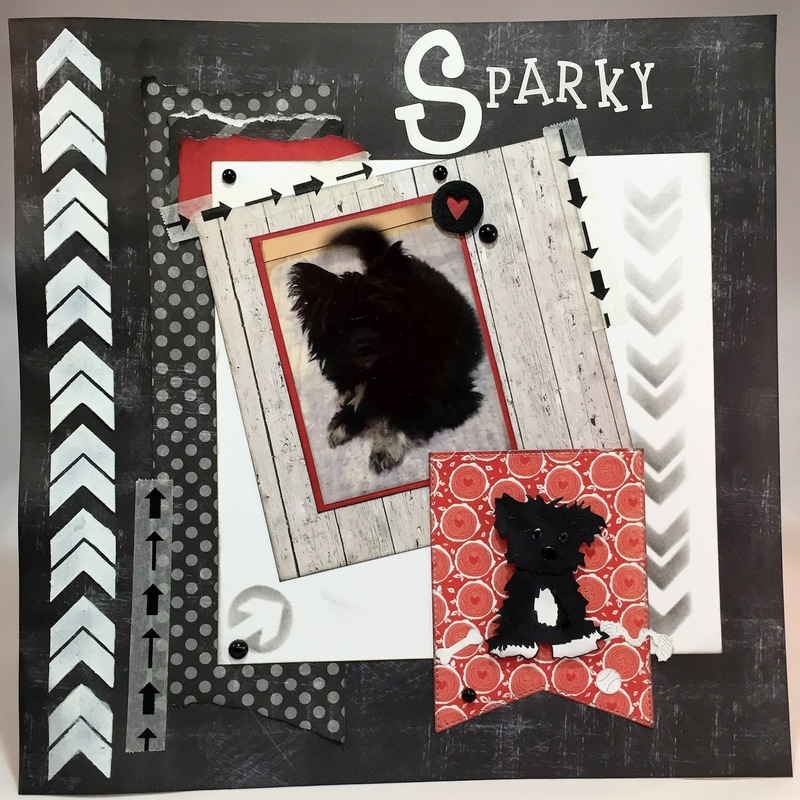 Alicia here today with a scrapbook page featuring my new dog Sparky. When I saw the Frantic Stamper Bobble Head Sweet Pea die, I had to have it! My Sparky looks just like Sweet Pea. It was hard to get a good picture of Sparky, he is always wagging his tail and his black fur makes his face disappear. I cut my die with white card stock and colored with alcohol markers. I left a few spots white right where Sparky has white patches. Since my little guy is black and white, I kept the layout black and white with just a splash of red. I have been hoarding this adorable paper and using the Tutti Designs Dies Nesting Stitched Banner die as a background for my Sweet Pea was perfect! What an adorable new puppy! 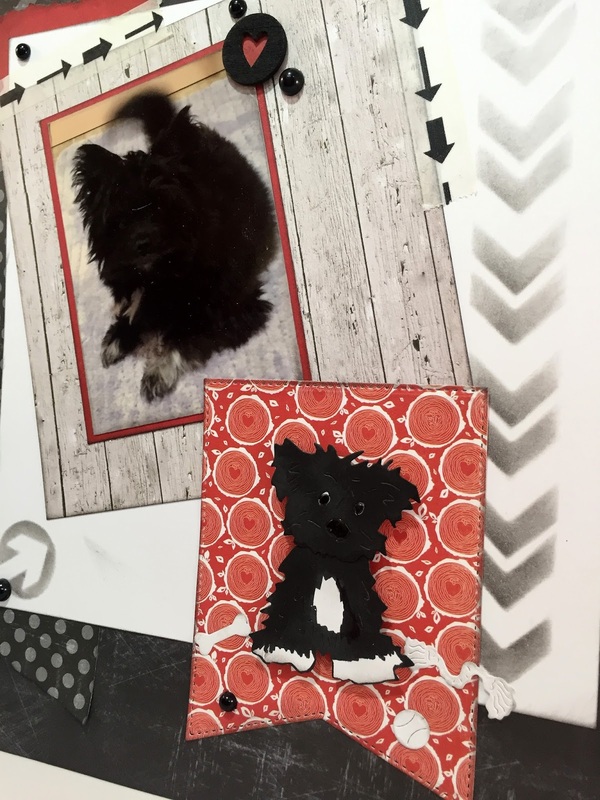 Yes, that die cut dog looks just like your little cutie too. What a fabulous page!! Dog and die, oh sooooo CUTE! Perfect layout too, I love all of the little arrow details, that sweet heart, his picture of course and your color choice! FUN! Such an adorable dog, Alicia. I also have a black dog with white paws and a white star on her chest and it's very hard getting photos of her face. Your sb page is full of cuteness, just like your dog. Thanks for the share. OMG this is SO adorable! What a fabulous layout page! Awesome inspiration ... thanks! thank you ladies! we had quite a scare last night when Sparky ate an ant trap!!! He is fine. I love my new baby but he gonna need some training soon! Oh my goodness is that ever adorable and goes perfectly with your sweet furbaby, how fun!! How cute is your Sparky! 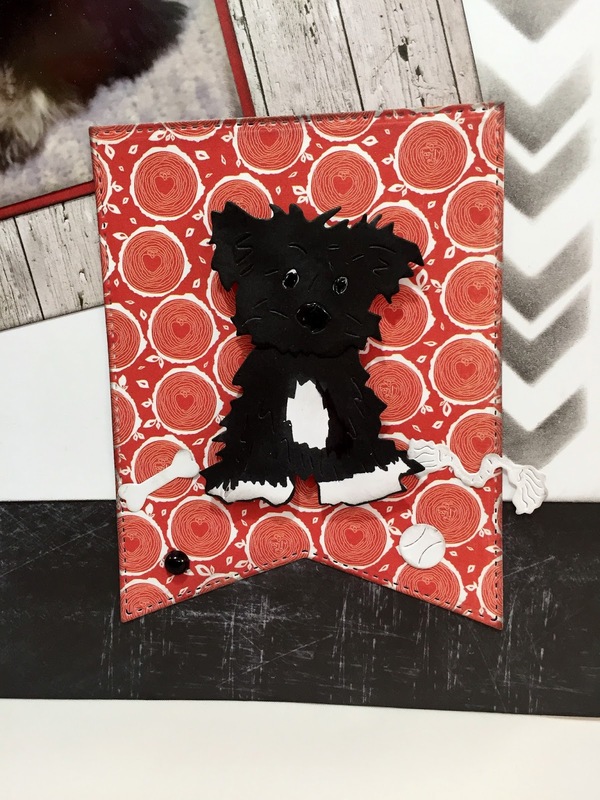 Love your layout and the die cut dog. Dancing Under the Stars . . .